I'd visited Istanbul three times, and lived here for almost a year, before I ever got around to poking my head inside Dolmabahçe Palace, the "modern" home of the late-Ottoman-era sultans. I can't say I thought I had been missing out on much. Sure, there's a 4.5-ton chandelier, and the minibar hidden inside a hollowed-out book is pretty damn cool. But it was hard to get excited about a place where everyone apparently spent all their time sitting in uncomfortable-looking straight-backed chairs on the far sides of large rooms from each other. Still, operating on the small-museums-are-better principle (and mindful of my beginning-of-the-year vow to Try More New ThingsTM), I decided to take a Saturday stroll to one of Istanbul's lesser-known palaces, Yıldız Şale (Chalet). Part of the Yıldız Palace complex in peaceful hillside Yıldız Park, it's got a charmingly tasteful wooden façade that wouldn't be out of place on a Swiss ski slope, but couldn't be further style-wise from the typically over-the-top Baroque mish-mash of furniture and decor inside. Like its bigger cousins, the şale can only be entered on a tour, by visitors whose shoes are encased in shower-cap-like pink plastic booties, but this particular tour is led by an affable fellow who sits around chatting and drinking tea until he decides there's enough people for a group (in this case, four). The Ottomans apparently thought being "modern" meant slapping together a bunch of different European influences -- French furniture, Italian wall treatments -- and throwing in a banquet hall richly decorated in Islamic motifs for good measure. The eager-to-impress sultan tacked on another wing to the şale every time Kaiser Wilhelm II came to town. The German emperor never had to sleep in the same bedroom twice. A 400-meter-square carpet is really, really big. And apparently has to be made in the room it's meant for requires knocking out an exterior wall to install. Tough to get up the stairs and in the door otherwise, I guess. Barbaros Bulvarı used to be a little country road, with green space all around. This is no surprise, of course, but it blows my mind anew each time I see a picture of Istanbul (this one in a ceiling painting) looking so bucolic. I think the şale may also have been the first building in Istanbul to have electricity, but don't quote me on that one. There's always something that gets lost in translation. 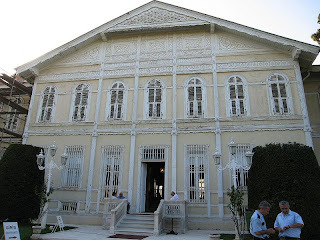 TO VISIT: The Yıldız Chalet (Şale Köşkü) is located at the top of Yıldız Park (it's a bit of a hike) in Beşiktaş, across from the Çirağan Palace. Regular admission is 4 Turkish Liras. Tours are given in Turkish and happen when they happen. Open 9:30 a.m. to 4 p.m. in winter (October through February) and 9:30 a.m. to 5 p.m. the rest of the year. Closed Mondays and Thursdays. We are interested in counting with you on Trip & Share, a new Trip-oriented social network that allows people around the world to share their trip experiences. We would like to have you as a featured member of our network so that you can show your blog to the community. An RSS feed of our featured members will appear randomly in the Main page for everyone to see their blogs and everything they have to say. Malaysia Asia and Africa Freak just become a Featured member and his blog is now in the main page. We count on you for the growth of our network, so that everybody that travels can get the most out of each trip. Hope we see you online!